No remote is required when it comes to adding LEDGlow’s Bluetooth Interior Kit to your car or truck. Experience our Million Color feature, which provides nearly-unlimited color combinations through the flexible strips which house this kit’s ultra-bright SMD LEDs. All of this is possible through the use of the Automotive Control app on your smartphone, which also provides several unique lighting modes and more. These eye-catching SMD LED strips will completely transform the look and feel of your car or truck. 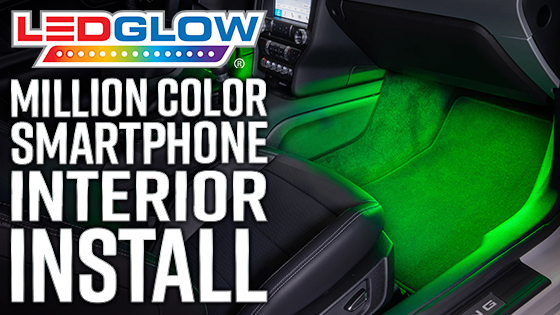 LEDGlow’s Bluetooth Interior Kit universally fits 36 surface mounted super bright SMD LEDs to the interior of any car or truck for a custom, one of a kind look. This automotive Bluetooth interior LED light kit features (4) 12” flexible tubes that are easily installed using improved automotive grade modular connectors that daisy chain each interior tube to the next. This kit can also hold up to (12) tubes total. And each interior tube features 9 SMD LEDs that add an ultra-bright multi-color glow to the footwells and underneath the seats. Your vehicle will be transformed with these one-of-a-kind interior strip lights for cars and trucks. These automotive Bluetooth interior LED light strips kits include a slim control box that features a Color Wheel with a nearly unlimited number of color combinations as well as Solid, Pulse, Sweeping, Color Chase and Flash Patterns. Through the LEDGlow automotive control app, you can also choose from solid colors such as blue, red, green, pink, purple, teal, orange, violet, yellow and white as well as different shades of those colors. The Solid, Pulse, Sweeping, Color Chase and Flash Patterns will also react to the music playing inside of your car courtesy of our Sound Activation Mode! Customize each lighting pattern by adjusting the speed levels to your preference. Out of the box, with 4.5’ of power wire and a pre-wired 5 amp inline fuse, these LED interior accent lighting kits for cars and trucks can be powered directly from the vehicle’s battery. For simpler installation that doesn’t require the splicing of wire or access to the battery, other power options are available. LEDGlow’s Expandable Circuit will power a phone-controlled automotive light kit’s SMD LED strip lights directly from the fuse box. The Cigarette Lighter Power Adapter will easily power your smartphone controlled automotive lighting kit directly from the vehicle’s cigarette lighter receptacle as well. As long as a 12 volt power source is available into which the kit can be wired, additional power options are available, allowing for extreme customization in any vehicle when adding LED interior lighting kits for cars and trucks. Using the auto illumination bypass mode, this kit with app controller can be set to illuminate when a door is opened, when the headlights are turned on, or when the ignition is engaged. This was a good product for a good price. I placed ot in my 18 civic Ex and had hardly any issue. I wish the lights came on with my car. But instead i have to start the app (its easy to use). I had a problem installing the fuse tap so i had to useva cigarette lighter plug instead.